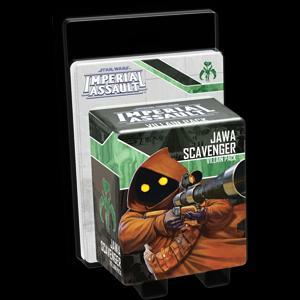 Star Wars Imperial Assault: Jawa Scavenger | Azazel's Bitz Box. 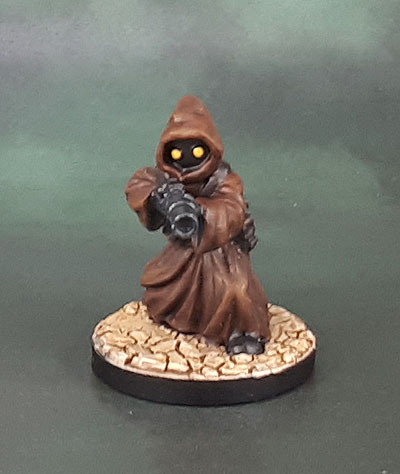 More Star Wars today, though it’s actually an official figure – the Jawa. The figure is pretty much this still in mini form. A pretty straightforward paintjob really. 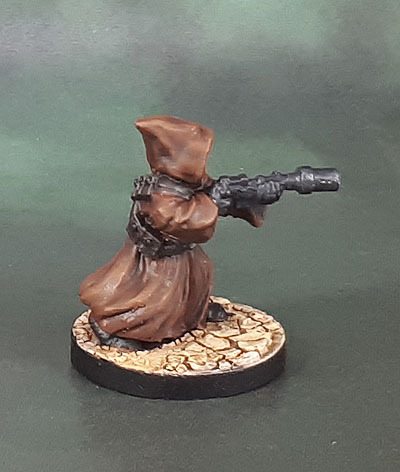 I painted the robes with a mix of darker browns and more ruddy browns, in homage to my old Kenner Action figures when I was a child. I also painted the webbing belts with darker browns so they’d be a little more differentiated. The Ion Blaster was painted in dark grey with dark metallic highlights. This entry was posted in Board Games, Star Wars and tagged Imperial Assault, Star Wars, Star Wars Imperial Assault Jawa Scavenger. Bookmark the permalink. I always loved Jawas. I have about half a dozen of the figures. Nice work AzMan. Ok so what I’m hearing is that you’ll leave it to me in your will yeah???!!! Ootini!! 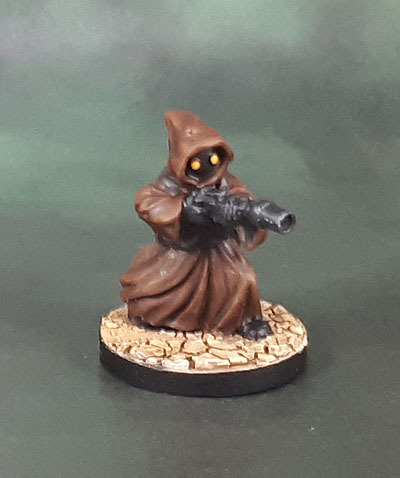 Nice job mate, I love Jawas 🙂 Fun fact – Jawas were the inspiration for Kev Adams’ seminal Night Goblins range… I had it straight from the horses mouth a couple of years ago! 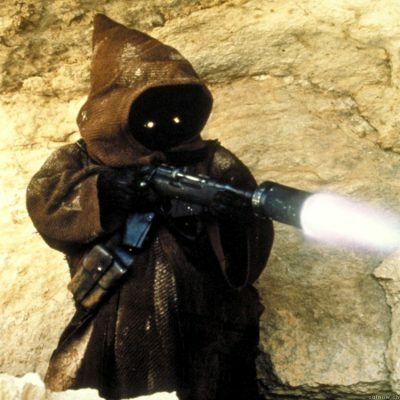 Haha, seeing that Jawa takes me back to when I first watched the original trilogy. 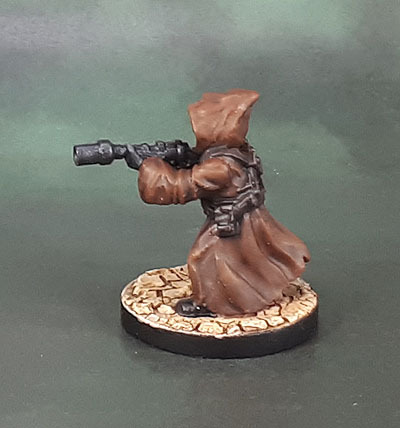 Lovely work, although I do have one suggestion: I think you should go back and lightly drybrush the lower part of the robes with a beige/ochre colour, so as to create a sense of built-up grime/sand. 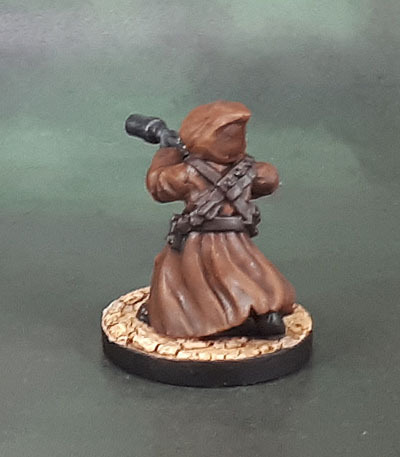 If you’re feeling adventurous, you could even try to emulate the sand stains from the reference picture you posted on the rest of the model. I like it! Simple, and sharply executed. I think the base is perfect for this mini. I may have to get some of the crackle paint to try out for some of my owb projects. Very nice- one of my favourite ‘aliens’ (along with the Sand People) from TOS. Technically speaking, I think it’s ace! Really nice work, and man do those eyes pop. Someday I need to try out that crackle base texture. I really like it for desert bases. I’ve seen it used well for chipped paint as well, though I haven’t used it for such yet besides a try on some vases on my old Ogre shooters. So cute! I love those crackle paints, too. I just kind of wish they’d come out with one in black. Come to think of it, I’ve had a bottle of Jo Sonja’s crackle stuff sitting around here for years now… I’d just need to find it. I need to put in an order with them at some point myself. The shipping is pretty hefty, so I need to be getting enough to make that worthwhile. 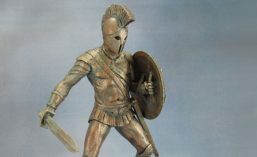 Im looking forward to my brother expanding his game with some of the individual figure sets. It was his 40th birthday Friday, so he has a treasure hunt to do to find his 3 expantion boxes befire we go camping. Its 5 clues that lead to 5 mat pieces that make no sense unless you overlay them in the right way to make a map of the house, and then a load of other clues on the map pieces written in the the common Star Wars alphabet telling him where to look on the map. … We may have to take the map pieces camping with us. It took My wife and our 2 friends over an hour to figure the map out and its a map of OUR house, and she knew where the present was. Hahah, good to hear the story ended well. Especially after that beginning!